The school had already been extended significantly beyond its original late Victorian core, a building of great distinction. Responding to ever-increasing pressures on space, this further extension was seen by the judges as a sensible continuation of the now-established approach, which does not attempt to match the decoration of the core building, but uses mainly low-key vernacular materials, in keeping with the overall feel of the village. In this latest phase, the addition of some coloured modern plastic provided an effective new accent. The judges’ main focus was on the interiors, where the advantage gained by significantly expanding the school hall was immediately apparent. 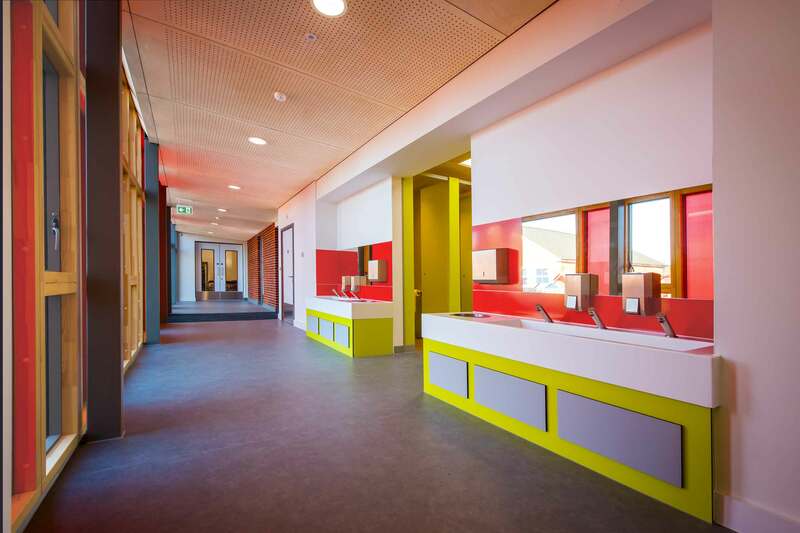 New classrooms and connecting corridors had been designed with a keen eye for the needs of young children, and the general impression was that a calming and supporting environment had been created, which would be beneficial to staff and parents as well as children. Expanded space had created the potential for greater community use of the school, and the overall impression was of a very worthwhile project, designed and carried out with great care.